These photographs show four views at different times of drug stores and other businesses on Broadway Street in Marysville, Kansas. 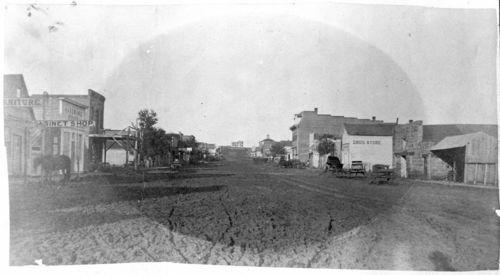 The first photograph shows Broadway looking east around 1873, with a building marked "Drug Store" visible on the right side of the street. The second photograph shows a view looking west on Broadway (although the caption calls it Main Street) around 1911, with a sign for "E. D. Vincent, Druggist" visible on the side of a building. An unusual sight in this photograph is a man standing on the top of a utility pole, visible just below the right end of the druggist sign. The third photograph, also from 1911, shows Broadway looking east, with the sign for E. D. Vincent's Drug Store barely visible in the background of the right side of the street. The fourth photograph shows almost the same view of Broadway looking west around the 1920s. The sign on the building reads "A and B Drug Company, the Rexall Store." The first two photographs have horses and carriages visible, the third photograph has both carriages and automobiles visible, and the fourth photograph has numerous automobiles visible along the street. Holding Institution: Mrs. Sylvester Schmidt, 1975. Mrs. Nyle Miller, 1956. Kimball House, Museum, 1974.